I am trying to glue a piece of clear acrylic 2mm thick to a piece of plywood that is 5mm thick. They are both 76mm by 50mm and rectangular in shape. They have some cutouts in the middle. It's supposed to be a keychain. Both are laser cut pieces, if that is important. They are cut exactly the same but I am sandwiching them together for aesthetics. What adhesives can I use that will cure optically clear, i.e. does not discolor or remain noticeable in the acrylic-wood sandwich? Cheap and quick curing options would be great but I understand you can't have the best of them all. Consider a clear-drying epoxy. Note that not all epoxies are equal. In a general sense they can bond different materials together with ease. Here is an earlier epoxy advertisement where they glued a car to a billboard with an epoxy resin. 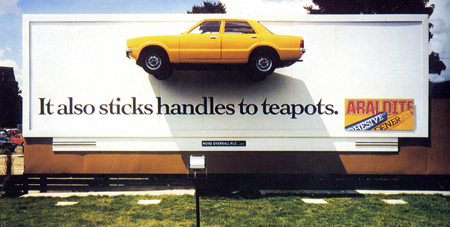 1983 a visual stunt presentation was set up to show the strength of Araldite by gluing a yellow Ford Cortina to a billboard on Cromwell Road, London, with the tagline "It also sticks handles to teapots". You can usually get 2 part epoxies in a dual syringe form and they are very economical. Depending how often you do this you might want to try a smaller one first as the shelf life of the product varies once used. Cheap and quick curing options would be great but I understand you can't have the best of them all. Only part about this that does not meet your requirements is that they have a longer curing time then something like a craft glue. Setting inside an hour but fully curing over several days is needed in some cases. The resin and hardener are kept separately as liquids, hence the dual syringe. In larger applications they would be two separate containers. I would suggest not applying directly to your project from the syringe but onto a disposable piece of cardboard or similar. That way you can manually mix the liquids together (usually 1:1 ratio) to ensure an effective reaction. Then use an applicator (craft sticks) to apply to the project. You are going to want to clamp this down with decent pressure. There would be the issue of seepage while setting you need to be aware of. Depending on how intricate your cuts are the solution will come out of the wood acrylic sandwich. You want to try and wipe that off before it sets. Epoxy resins dry really hard so if you have to cut part of it off it will no longer show clear on the cut. You can polish the edges once it cures with extra fine sand paper and / or a polishing compound. A long term issue is that set epoxies can yellow over time because of UV radiation. That is likely a moot point as you are making a key chain. Look for clear epoxies, sometimes sold for encapsulating. They'll stick fairly well to both materials, though presumably not as well as epoxy sold as glue. You have a lot of contact area so the bond will be strong anyway. A two part epoxy should be quite cheap - if you can get an appropriate size pack, and I'd expect curing over a few hours though you might be able to get quicker. To have it as clear as possible, you need to make sure that you apply enough to fill the gap and get all the air out. I've bonded two sheets of clear plastic (one acrylic, one unknown) using ordinary glue epoxy (i.e. not meant to be transparent). That was good but not good enough for your needs. It was very slightly milky, and it cured before I had time to make a jig that would apply enough so I had a few bubbles. It is possible to sand and even polish (with fine wet-or-dry paper) cured epoxy, so it could be used to seal the edges as well. This might be too much work though. Instead of epoxy, an alternative is using peg mounts, similar to sword hilts/knives. If you are worried about the epoxy yellowing, you can drill two holes and insert pegs to secure the acrylic to the wood. It would still be aesthetically pleasing to look at while securing the two pieces together. Most craft stores sell pegs in all sizes. Or you can make you own pegs depending on how big you want the hole size to be. For something like a key chain, you could use a 1/16 drill bit and then insert pegs for a clean look. 105/207 has strong physical properties, so it can be used as a structural adhesive for gluing and laminating. It has excellent compatibility with paints and varnishes. An ultraviolet inhibitor in 207 helps provide a beautiful, long lasting finish when used with quality UV filtering varnish. 105/207 cures clear and colorless.